I updated this post for the 2018–2019 flu season. If you work for yourself, the flu vaccine may be the only thing standing between you and two to three weeks without pay. The flu is not a cold; you will be miserable. You might miss deadlines and you won’t get paid. And you also won’t feel up to doing all those things freelancers must do to secure future gigs and income: brainstorming, networking, pitching. So, freelancers, please get your flu shot.. 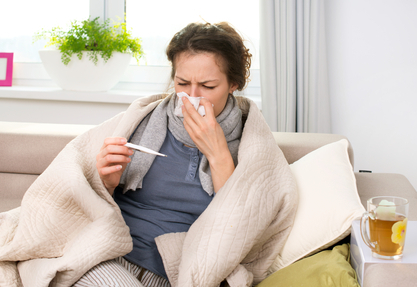 The flu season typically runs from October 1 through mid-May, usually peaking in February. Last flu season, there was high flu activity in January and February, continuing through the end of March, making the 2017–2018 flu season one of the longest in recent years. The flu is not just an annoyance or similar to a cold. You will feel awful for several days and will not feel up to working, doing chores or taking care of your kids. And 12,000 to 56,000 people die every year in the U.S. from the flu. Last year, 180 children died—compared to 99 the year before. And while many deaths occur in the very old or very young, adults ages 18 to 64 accounted for 60 percent of the hospitalizations in 2013–2014. The Centers for Disease Control and Prevention (CDC) recommends the flu vaccine for everyone in the U.S. ages 6 months and older. Flu vaccines are covered by most health insurance plans. And if they’re not, they usually cost only about $30. The flu shot is recommended for all pregnant women and can be given safely in any trimester. This means if you find out you’re pregnant in March, toward the end of the flu season, you should still get the shot. I spent eight years as an editor/writer at the American College of Obstetricians and Gynecologists, where I learned that pregnant women are particularly vulnerable to the flu, which can also harm their babies. Plus, if a pregnant woman gets the shot, it offers some protection to her baby, which is important because babies younger than 6 months old cannot get the flu shot. For people 65 and older, the Fluzone High-Dose shot might be a better option, offering more protection; older people are often more vulnerable to the dangers of the flu. I’ll end with addressing my biggest pet peeve: those who claim they got the flu from the flu shot. This is scientifically impossible. The flu shot is made with a dead virus and cannot give you the flu. Now, you might get the shot and have a sore arm or a slight fever. And, there is also a small risk of a vaccine reaction. It can take up to two weeks for the flu shot to take effect, and no vaccine is 100 percent effective, so you may still get the flu (perhaps a milder case)—but you didn’t get the flu FROM the vaccine. You might also catch a winter cold or another virus; the vaccine doesn’t protect against that. By getting a flu vaccine every year, you aren’t only protecting your paycheck, you’re protecting your relatives, your neighbors and your community, too. No vaccine is perfect, so the more people who get the vaccine, the more protection it offers the general population. This is called herd immunity or community immunity. So, please, roll up your sleeve.